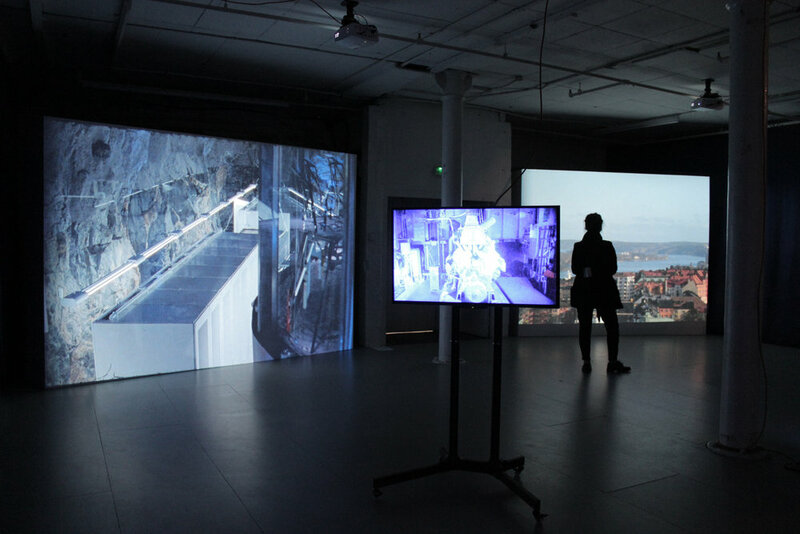 South Kiosk presents And the Earth Screamed, Alive*, a solo exhibition by Emma Charles, featuring a multi media installation of her 16mm film White Mountain (2016). South Kiosk has invited Emma Charles for And the Earth Screamed, Alive to transform its space and take the viewer on a journey through the concealed and protected architecture of the data center, creating an immersive installation by deconstructing 16mm film project White Mountain, through a combination of projections, tv screens, monitors and print, this solo presentation focuses on the handling of digital information. Also for this exhibition Charles has created a soundscape using a variety of audio recording devices. Gathering vibrations and electromagnetic sounds from the rock face above the data center as well as deep inside the server rooms itself, Charles has created an audio composition both revealing and processing the reverberations of the hidden environment. *“And the Earth Screamed, Alive” Jussi Parrika, A Geology of Media, University of Minnesota Press (2015).